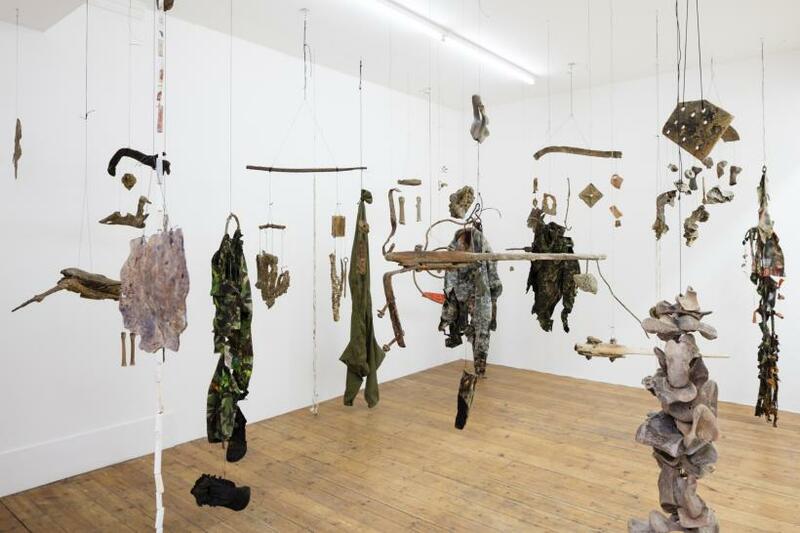 Title : Installation view, Condo: Franziska Lantz, expanding arid zones, Rodeo hosting Supportico Lopez, Rodeo, London, 2017. In the corridor of Rodeo Gallery’s reception, fragments of material hang in an assemblage of abstracted male and female forms. Lurking silently, the figures observe my arrival. The assemblage is part of a new body of work by Franziska Lantz on show in the first floor gallery space. Entering the gallery, the quiet elegance of the hallway is reconfigured into an immersive installation of further hanging remains and thundering techno beats. 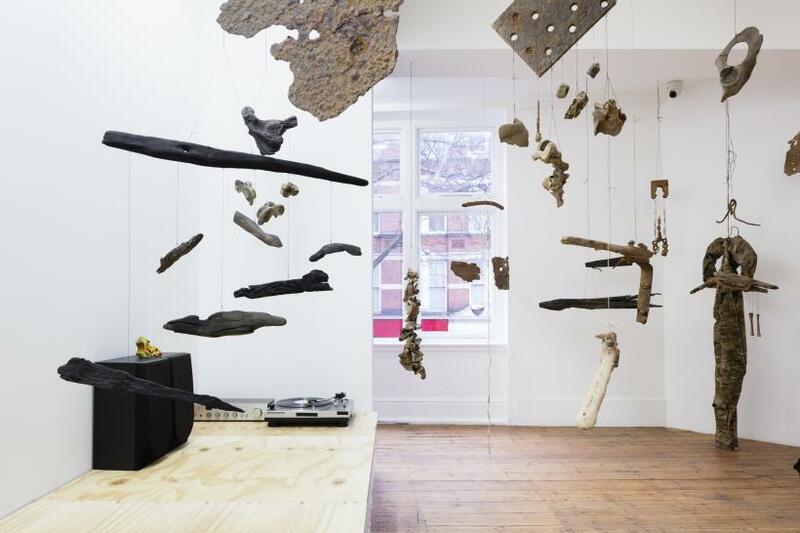 Suspended bones, corroded metal and driftwood fill the space. 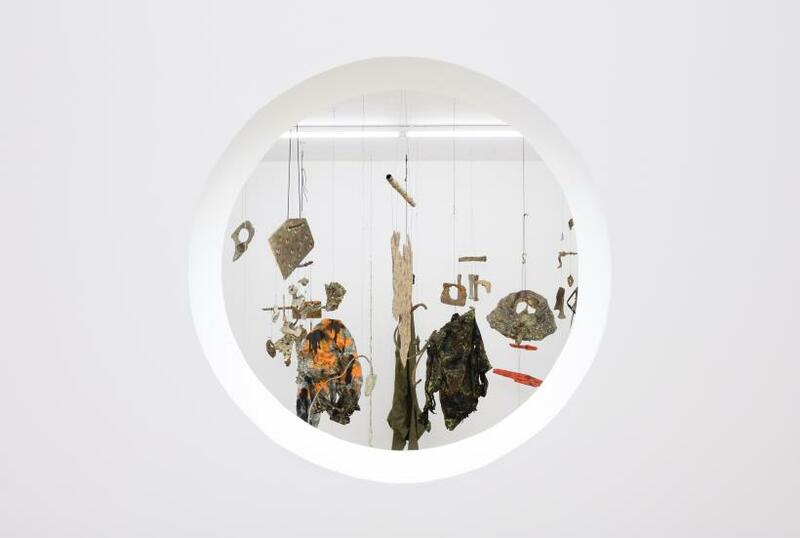 Found in the thick mud of the Thames, Lantz has carefully cleaned and rearranged her collected specimens into spectral assemblages animated by the repetitive beats of her recorded sound track. Beside the spinning vinyl, a small bone rests on rough wooden seating, tempting the viewer to pick it up and grind bone on bone in time with the techno beats. The relentless drumming of the record infuses the installation with an overtone of aggression. 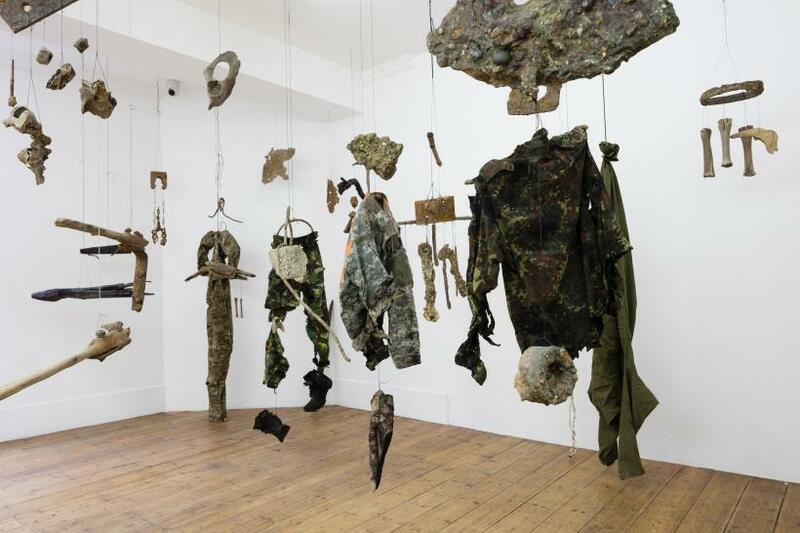 This initial impression is further heightened by the muddied camouflaged clothing that hangs among the anthropomorphically assembled remains. Draped from wire the fabrics form the torsos and limbs of life-size figures – soldiers, warriors or militia. Large posts of river-worn wood with twisted metal bolts hang horizontally at their hips, suggestively waiting to be used as guns, clubs or other pieces of weaponry. Bringing the corroded, weathered and degraded remnants back to life, Lantz seemingly facilitates a spectral resurrection of an unidentified event of violence by its shattered remains. The ominous figures haunt the gallery as if from some past, future or indeed contemporary zone of conflict. Yet another thread of associations imposes itself with the title of the show. ‘Expanding Arid Zones’ evokes the looming threat of climate change and ecological disaster – a foreboding future that seems to go hand in hand with images of violent conflict over the scarcity of resources necessary for human survival. The waste objects retrieved from the Thames look like remnants from London’s industrial past. These are traces of human activity which, so it seems, has brought about its own eradication by its inherently destructive nature. Preserved by the natural rhythms of the thick muddy banks of the tidal river, as well as retrieved and assembled by the artist, the remains suggestively begin to evoke narratives of a coming dystopia. 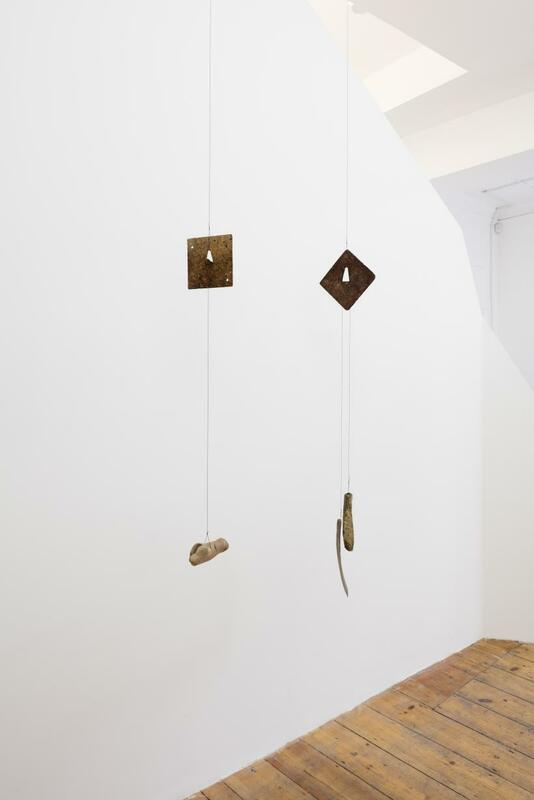 Represented by Supportico Lopez, Lantz’s exhibition forms part of ‘Condo’. 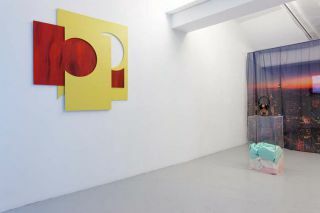 ‘Condo’ sees commercial spaces in the city host international galleries in a series of collaborative exhibitions. Initiated in 2016 by Vanessa Carlos, co-founder of Carlos/Ishikawa gallery in Whitechapel, the project centres upon collaboration with galleries, sharing resources and audiences in a united effort to promote, sell and market their respective artists’ works. 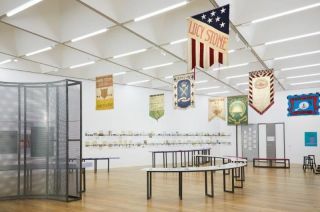 This year sees 15 spaces across London host 36 galleries from North America and Europe, as well as galleries from China, Guatemala and Brazil. Instead of the competitive edge of the art fair booth, the model of co-hosting fosters strong working relationships between all those participating. When reflecting on her own experience of the scheme, Lantz speaks about the project as having a family feel, in which ideas are shared in a collaborative spirit of generosity. With co-hosting, the financial implications for the visiting galleries are lessened. In an interview with ‘Frieze’ last year, Carlos said: “The participating galleries are only paying the minimum cost and the hosting galleries are only giving in kind. For me, if you do something like this in a city already so prohibitive in terms of cost as London, you can create a situation where galleries and artists actually have the freedom to experiment.” With the financial pressure elevated, visiting galleries can take greater risks in terms of showing younger artists or less commercial work, providing an exciting mix of artists that may not ordinarily have the opportunity to exhibit in the capital. The proposition that rings true with Lantz. Although based in London she has not often shown in the capital and her work for the group exhibition ‘Bloody Life’ at Herald Street last spring, took a more restrained tone. Alongside experimentation and collaboration ‘Condo’ invites its audience to explore not just new artists and works but also the city itself. A free map marks out the different spaces and locations of the London galleries participating in the project. Counter to the art fair model of having everything in one place, a place that could often be located in any major city across the globe, ‘Condo’ provides a rich offering of diverse exhibitions in conjunction with the situated experiences of London’s unique visual art landscape.